Dr. Annapurna Garimella is a designer and an art historian based in Bangalore. Having completed her B.A. from California State University, she went on to earn her M. Phil and Ph.D from Columbia University, New York. She heads Jackfruit, an organisation with a specialised portfolio of design, research and curatorial projects. She is also founder of Art, Resources and Teaching Trust, a not-for-profit organisation that runs a public art library, conducts independent research projects and does teaching and advisement for college and university students and the general public. 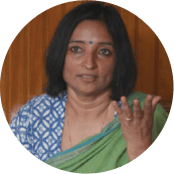 She was the former Research Editor and Advisory Board Member for Marg Publications and is currently on the board of the S N School of Art and Communication, University of Hyderabad. She is the author of the book, ‘The Artful Life of R. Vijay’ published by Serindia Publications in December 2015.